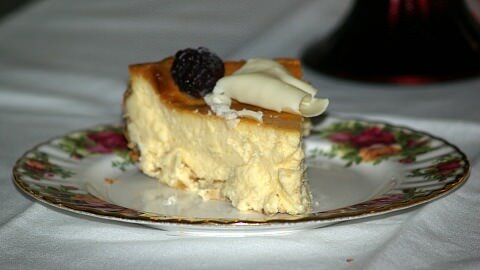 By knowing how to make white chocolate cheesecake recipe, you can present a delicious dessert. 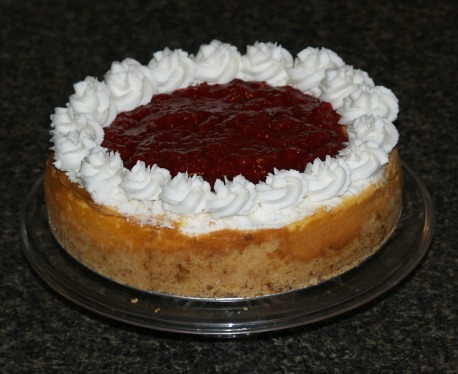 It can be served plain, topped with almost any type of fruit topping or made with a fruit puree swirled through it. This is a great alternative to the chocolate cheesecake or a Chocolate Turtle and still has the rich creamy flavor and texture. I love this recipe topped with fresh raspberries. A dark chocolate glaze recipe or lemon sauce recipe are also excellent choices for topping the dessert. 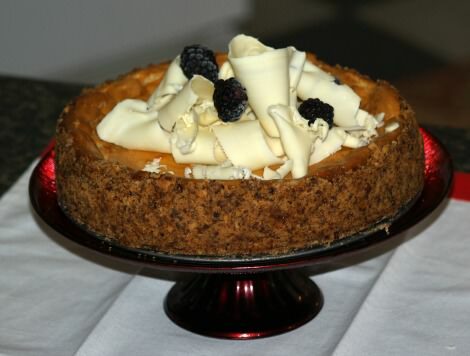 If you learn how to make white chocolate cheesecake recipe you will learn that it does not really contain chocolate at all. Just what is white chocolate? It is a combination of cocoa butter, milk and flavorings. This chocolate is characterized by a pale yellow color; you might call ivory. It seems to melt at a lower heat point than darker chocolate but will still stay solid at room temperature. (I find the white much easier to dip when making candy for this reason). During the processing the dark solid of the cacao beans are separated from the fatty content and are not re-blended like in the dark chocolate. If your learning how to make white chocolate cheesecake this white ingredient is available in several different forms in the supermarket. A baking bar is a high form of this chocolate and contains the greatest amount of cocoa butter. Vanilla milk chips are similar in quality to the baking bar. These are available in regular sized chips and in a large disk shaped form. The vanilla milk chips melt well for use also in glazes and fillings. Be aware of vanilla candy coating which is similar in appearance; it might be listed as a confection or almond bark. This contains higher amounts of sugar and less cocoa butter; not to be used in white chocolate cheesecake recipe. This recipe has a chocolate layer and a white chocolate layer; then topped with chocolate glaze recipe. For crust combine flour, almonds, brown sugar and salt; cut in butter until coarse crumbs. Add water and stir to moisten dry ingredients; press in bottom 9 or 10 inch spring form pan. For chocolate layer melt chocolate chips and butter stirring until smooth. Remove from heat and stir in flour, brown sugar and cinnamon; mix well. Add eggs and vanilla; beat well and spread over crust. For white chocolate layer melt white baking bar and butter stirring until smooth; cool slightly. In mixing bowl beat cream cheese, sugar, eggs, flour and vanilla until smooth. Stir white chocolate into cream cheese mixture; beat on high speed 1 minute. Pour mixture over filling in pan; sprinkle with sliced almonds. Bake on bottom rack of oven for 25 to 30 minutes or until light golden brown. Cool; run knife around rim to loosen sides of pan. Melt chocolate chips with oil over low heat stirring constantly until smooth; drizzle over the top. Press crumbs in bottom of lightly greased 9 inch spring form pan. Bake for 5 minutes and cool on rack. Melt white chocolate in heavy saucepan over low heat stirring constantly; set off to cool. Beat cream cheese on medium speed until creamy; add sugar and beat 5 minutes longer. Add sour cream, brandy and vanilla; mix until blended and pour into prepared pan. Bake for 30 to 35 minutes; cool 10 minutes on wire rack. Gently run knife around edges of pan to release sides; cool completely on wire rack. Cover and chill 8 hours; remove from pan and garnish. Combine the flour and sugar in a mixing bowl; cut in the butter with a pastry cutter until crumbly. Grate 4 ounces of the white chocolate. Add grated chocolate, nuts and the 1 beaten egg to the crumbly mixture and mix well; press in the bottom and on the sides of a 10 inch spring form pan. Chill. Chop remaining 12 ounces of white chocolate. Mix with the whipping cream in the top of a double boiler and cook over hot water (not boiling) until chocolate is melted. Stir in the vanilla and keep warm. Beat the cream cheese with a mixer gradually adding the can of milk. Add the 4 eggs one at a time beating well after each addition. Stir in the warm chocolate mixture and pour batter into the chilled crusted pan. Bake for 1 hour and 20 minutes. With a thin sharp knife separate the cake from rim of pan but allow to cool before removing rim. Refrigerate overnight or until very cold. This delicious white chocolate cheesecake recipe is the perfect combination of white chocolate, coconut and cream cheese. Wrap heavy duty foil around the bottom of a 9 inch spring form pan. Mix crumbs and butter in a small bowl; press into bottom of prepared pan. Beat cream cheese and sugar in a large mixing bowl until smooth. Beat in melted chips, coconut milk and extracts; add eggs and beat on low speed just until blended. Fold in ½ cup of coconut; pour over the crust. Place spring form pan in a larger pan; add 1 inch of hot water to larger pan. Bake 60 to 70 minutes or until center is set and top appears dull. Remove spring form pan from water bath; cool cheesecake on rack for 10 minutes. Loosen sides with a knife and remove the foil; cool 1 hour longer. Refrigerate overnight; cover when completely cooled. Remove the rim from the pan and sprinkle remaining coconut over the top. TO MAKE CRUST combine crumbs and butter; press on bottom of 9 inch spring form pan. FOR LAYER 1 beat cream cheese with mixer until smooth. Add sugar and vanilla beating until well blended; mix in melted white chocolate. On low speed beat in one egg at a time just until blended; pour mixture over crust. Bake 50 to 55 minutes until center is almost set; cool 10 minutes. Run knife around edge to loosen cake from pan; cool completely. FOR LAYER 2 beat cream cheese and sugar in large bowl until well blended. Blend in melted semi sweet chocolate; spread over cooled cheesecake. Refrigerate 4 hours; garnish with chocolate curls.